Relax in a comfy dressing gown! Jump out of bed and keep warm in your brand new Gold Coast Suns Dressing Gown. This terrific bath robe is made from a super soft felt-like polyester fleece material - perfect for lazing about in while watching the footy on a cold winters day, or for when you just can't be bothered getting dressed! The robe also has two front pockets, a fabric tie and belt loops, and the clubs logo proudly embroidered on the front. It also has the clubs name on the back. 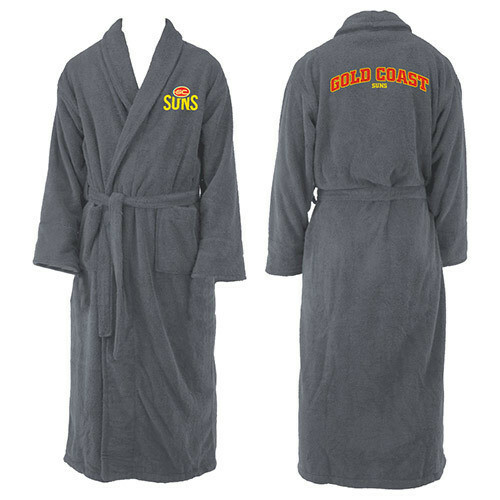 One size fits all and suitable for both men & women, a Gold Coast Suns Adults Bath Robe makes a terrific gift - be it Mothers Day, Fathers Day or any other day!